Pizza Place in Stand Alone Location for sale wa. Pizza Place in Stand Alone Location w/ warm inviting atmosphere & Drive-thru - Perfect Conversion too! Price Just Reduced for Immediate Sale! 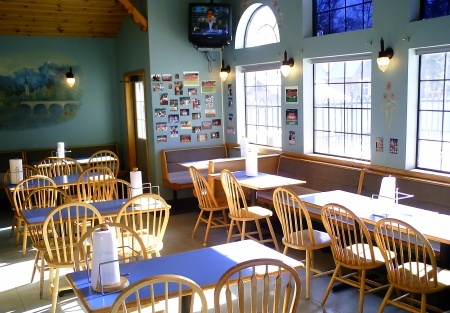 This large profitable pizza restaurant is centrally located in one of Washington's premier tourist destinations. The restaurant is surrounded by hotels and retail stores attracting plenty of customers. Currently the restaurant focuses mainly on pizza but there is a possibility to expand the menu into basically anything you want. The restaurant comes fully equipped with commercial equipment including a hood, grill, pizza ovens, grease trap, cooler, walk in freezer, cooler, etc. The restaurant with drive-thru window used to be a Dairy Queen before it was converted to a pizza place. The dining room includes a beautifully center piece fire place and vaulted ceilings. The possibilities for a new owner are endless. Take advantage of the opportunity to own a proven profitable business in Washington's hottest tourist destination and select one of the orange buttons below to get more photos and the location of this store. This is not a Paramount Restaurant Broker, Inc. Listing and Paramount Restaurant Brokers, Inc. assumes no liability for this ad or its content. Larry Braden is the listing broker and is licensed in Washington State. This is a Larry Braden listing. Beautiful Fire Place in Dining Room! One of Only 2 Pizza Places in Town!